Brad Sparks’ entry is basically the same. There is little in the way of additional information from these two sources. Phase 1 - The witness was driving west on route 36-27 and saw a bright light. It was so bright they had to squint at it. Phase 2 - The witnesses then saw a light, which was not as bright to their right above the tree line. They got out of the car to ob- serve it and then it appeared to take off. They attempted to pursue it. Phase 3 - The drove another two miles before they got out again and watched the object for two more minutes. They then drove down a dirt road to pursue the light some more. It rose, looked like the setting sun, and then rapidly disappeared to the west. In a letter written to Blue Book in December of 1964, the witness gave a description of the sighting.3 They stated they were driving west on route 36-27 and saw a bright light to the left (according to the witness this was to the south). The light disappeared shortly after this. They proceeded west again and then saw a light above the treetops. They stopped for a short period and the proceeded west again. The light disappeared a second time. The proceeded west another two miles and saw the light in a field. After watching it for a short period of time, they got back in the car and attempted to pursue it down a dirt road, it then disappeared in the west. 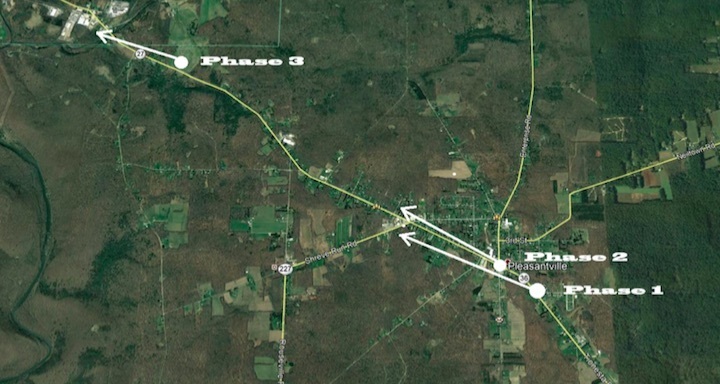 In a letter addressed to his congressman, the witness stated that phase 1 of the sighting happened while approaching Pleasantville. The second phase happened while in Pleasantville and the third phase happened on a hill between Pleasantville and Titusville. He also added that during phase 2, the light was just off to the right of the car above the treetops. The stories all appear similar and we can get a general idea of what was seen from where based on all of these accounts. This map can give us a general idea of the direction the object was when seen from the various locations. Looking at the map, one can see a trend. They were always looking in the same general direction between Azimuth 280 and 320 degrees. Was there anything in that direction on May 26th at 11 PM? Was this DST or EST? Looking at the Oil City Derrick (about 13 miles from Pleasantville) they listed sunset being at 839 PM on May 22nd, which indicated DST was in effect for that region of Pennsylvania.6 That makes the time 11 PM EDT, which is 0300 UTC and not 0400Z as listed on the Blue Book record card. The next thing is to look at what celestial objects might be visible on that date and time. A prime candidate immediately appears in the Venus was at azimuth 303 degrees and 2-3 degrees elevation. It also was very bright at the time at magnitude -4.4. The road SR 36-27 does not go east and west as suggested by the witness. Instead, it goes in a west-northwest direction between Pleasantville and Titusville (approximately 301 degrees). Prior to entering Pleasantville, the road is towards the northwest (azimuth 322 degrees). Looking at Venus in relation to the locations for Phase 1 and 2, we see that Venus would have been on the left side of the road during phase 1 and on the right side of the road during phase 2. In a moving car, the light would appear to go from one side of the road to the other. With such a low angle of elevation, it would not take much for the light to disappear and reappear. Because Venus was being viewed as it set, it would appear to dim as time progressed due to atmospheric extinction. 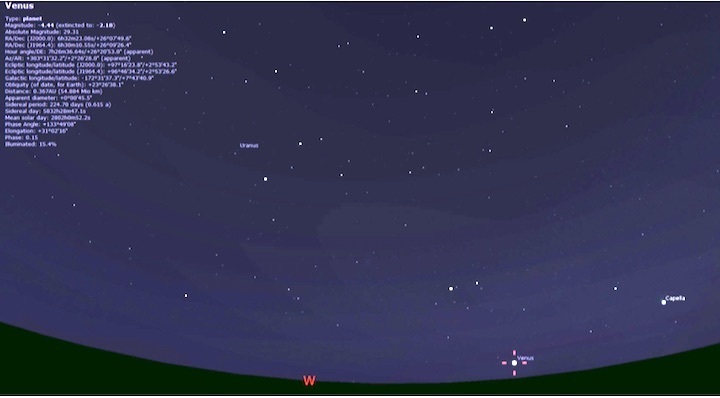 Venus set about 0318UTC (1118 PM EDT), which closely matches the time the witness estimated as the end of the event. While we cannot positively prove that Venus was the source of this sighting, there is good reason to suspect that it was the UFO. The witnesses did not report seeing Venus even though it was in the same direction as the object being reported as a UFO. Finally, the object disappeared about the same time Venus set. I would list this as probably Venus and it should be removed from the list of 701 unknowns.